Does your door close automatically and you want a door stopper that actually works and doesn't slide around no matter what? Our door stopper made of fremium quality TPR rubber,a durable high-quality addition to your home,our product are tested for safety and quality. Our door stop is worth to trusted absolute and it is high quality.It is flexible and durable,soft rubber door stopper, don't worry it hurt your door. Have tested for safety, it is non-toxic non-greasy and non-smell door stopper rubber,it is safe and you do not worry there's harm to your child. Compare to wall mounted door stopper, ours not need to drill a hole into wall or door to install it. DO YOU OFTEN FIND YOUR DOOR STOPPER? Don't worry,our rubber door stopper with 4 free bonus holders,convenient to store your rubber door stoppers when it is not used. And you will no longer lose your door stopper, dose it super convenience? It's better done than thought. Don't hesitate. buy something here,Come on! SAFE RUBBER MATERIAL - Airsspu decorative door stopper is made of premium quality TPR rubber,non-toxic,safe,do not worry there's harm to your child. 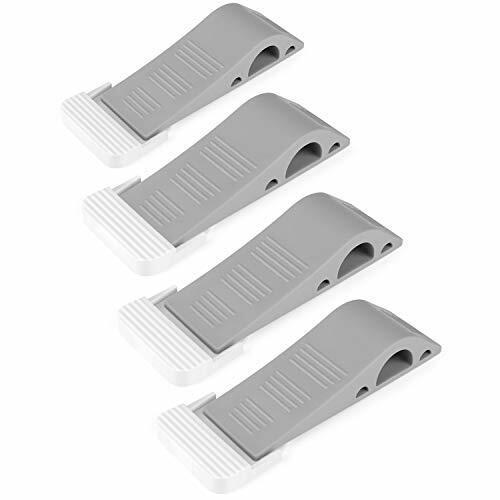 NON-SKID AND DURABLE - Our unique sloped design and anti-slip base provide ultimate gripping power,rubber door stopper has features of high elasticity and high wear resistance, it fits multi kinds of floors such as wood carpet tile laminate concrete floor and more. THE IDEAL SIZE - It is L 4.8" x W 1.6" x H 1", if your door gap is higher than 1", please stack double door stoppers to stop your door,it works with all of your doors. 4 FREE BONUS HOLDER - This decorative door stops come with 4 free bonus holders which can be adhered on your door, you can put the door stop into the holder after use it, your door stoppers will never be lost. SATISFIED SERVICE：Contact us if you have any quality problems or others. If you have any questions about this product by Airsspu, contact us by completing and submitting the form below. If you are looking for a specif part number, please include it with your message.